Do the smooth lines of contemporary bathroom décor appeal to you? Are you interested in figuring out how to incorporate the latest advancements in powder room design and convenience into your home? 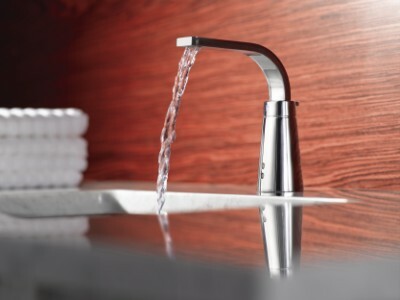 Do you relish the ease and convenience of hands-free faucet technology? If you can answer yes to one, two or three of the above questions, a Destiny™ hands-free electronic faucet from Moen might be the perfect addition to your powder room, or to master or guest bathroom design. Part of the Showhouse® by Moen® collection, the Destiny™ bathroom faucet features the latest technology in touchless activation. available coordinating accessories, which include a paper holder that pivots, a robe hook, a towel ring, and towel bars in two different sizes. Destiny's™ hands free technology provides a hygienic advantage by limiting the spread of germs and bacteria, and is an ADA (Americans with Disabilities Act) compliant fixture. The Destiny™ faucet is also an eco friendly bathroom fixture, aiding in conservation with its built-in infrared sensors that automatically stop and start the flow of water.